It is quite common for skirt board, girts, and truss carriers to be scabbed to the outside of the foundation posts. This is the easiest, quickest, and cheapest method for barns not finishing the interior of their walls. Ring shank nails are used on truss supports and common nails are used on girts and skirt. Bookshelf girts (also called commerical girts) provide added strength against high wind and perform a secondary function, the nailing surface for interior sheathing. This method is simple enough. The girts are laid flat between the posts, typically at 24" on center, with 2x6 strongback support. 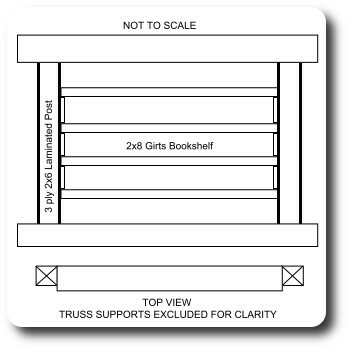 When girts are bookshelfed, grade board and truss carriers (or girders) are notched into the post. This involves notching the post 1 1/2" to fit the dimensional lumber flush with the post so you can install the siding. Also, posts are embedded at the exact length and width of the building, rather than being inset 1 1/2". Another option is to size the girts 1 1/2" wider than the posts allowing the girt to protrude out parallel with the truss supports and grade board as shown below. This eliminates notching and provides a deeper cavity for insulation and air gap.